We are delighted to have been part of the construction and development of the soon-to-be-opened Weaver Park, situated between Cork Street and Chamber Street in Dublin 8. This is the first major project to be developed as part of The Liberties Greening Strategy. The project is being carried out by Dublin City Council, and P Mac is very proud to be part of such a wonderful project. Weaver Park will be the first purpose-built public park in the Liberties Community since St Patrick’s Park was developed in 1904! The P Mac team is currently on site polishing all the concrete footpaths and skate ramps throughout the park. There are over 1,000 meters of concrete to polish, and will take our team three weeks to complete. Although most of us are loving this fabulous spell of sunshine, please spare a thought for our team in their full protective clothing on site! 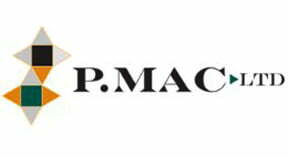 P Mac is working in the entire park area. The service is being led by Jason and Vasil, and our newest member to the team, Jimmy, is getting his on-site training. We are carrying out the concrete grinding using the wet system, avoiding contaminating the area with concrete dust. 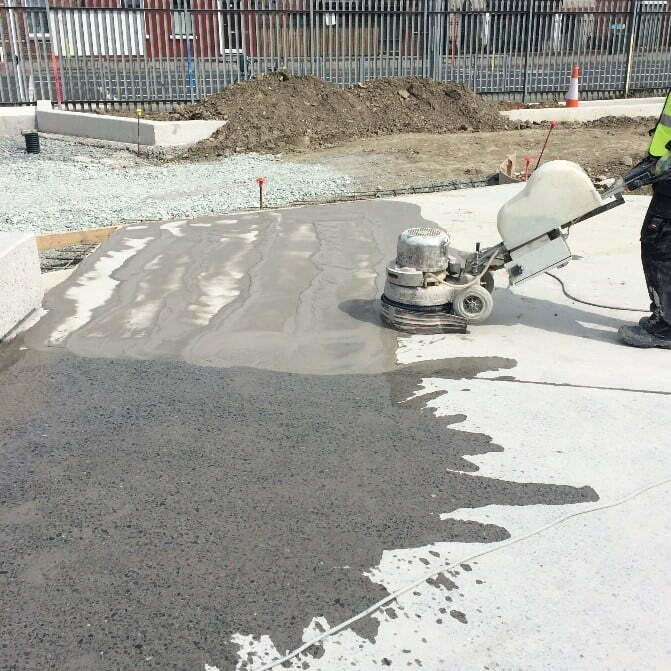 All concrete slurry is vacuumed up and disposed of in an appropriate manner. Polishing the purpose-built skate ramps will need to be done by hand. The polishing process will greatly enhance the aesthetics of the landscape, as we grind off the dull and drab appearance of the concrete slabs and expose the aggregate underneath. The grinding process will also render the concrete dust free and close up the pores in the concrete, sealing them and rendering them easier to maintain. 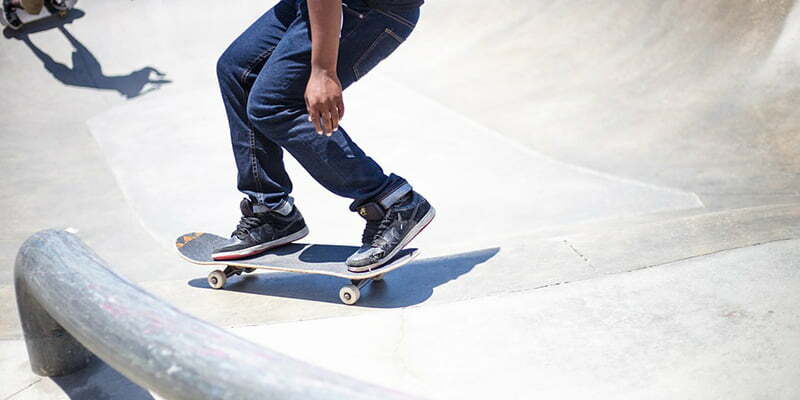 More importantly, we will grind the concrete to a 200 grit – offering safe slip resistance, even in wet conditions, for all skaters and visitors to the park. 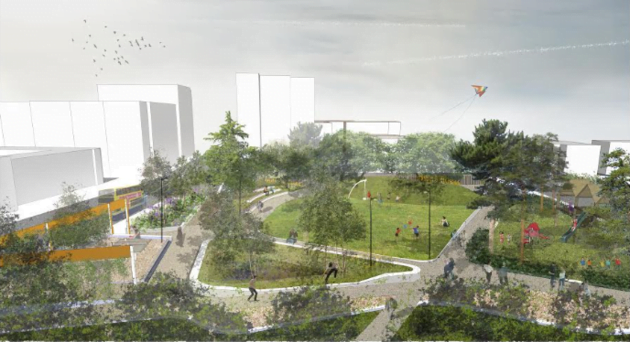 The park is part of the series of greening projects that the City Council plans to undertake over the next few years to support and develop The Liberties community and communicate the aspect of the local heritage. However, Weaver Park’s development originally came about thanks to pressure from local groups. The concept of the skateboarding park was prompted by the skateboarding group Skate D8, who have been campaigning for a few years to find a green space for a skate park in Dublin 8. According to Skate D8, it is difficult for skateboarders to find a proper place to practice, as they are often moved on from public areas that are not designated specifically for skateboarding and tend to be fitted with metal balls and strips to stop people from skating. Weaver Park is being built on the derelict site that once housed the Chamber Street flats, which were built in the 1970s and demolished in 2008. The site was closed off for eight years and the plan was to sell the land to developers. Thankfully, the local community got together and, with the support of local councilors, blocked the sale and petitioned to keep it for community use, citing the lack of green spaces in the area. The city manager stopped the levelling of the park in 2013, and entered into talks with local groups to come up with a plan for the derelict site in the heart of The Liberties. They also explored the option of urban spaces in the south central area and how they could be used for skateboarding and, at the same time, be used as an amenity and cultural resource for the community. The council entered into workshops with local communities, asking their opinion on how best to use the space to meet the needs of its residents and visitors. 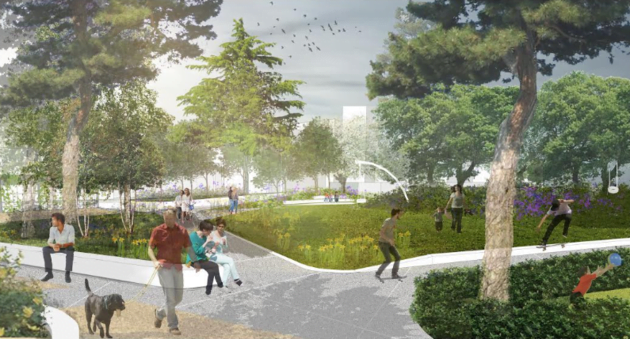 A green space, a community space, and a playground made up more than half of the participants priorities for the park. These were added to skate park facilities to create a park for community events and other activities. Works, which commenced in January, include a large lawn for games and activities, an enclosed play area, a terrace, benches, a large playground for children, the design of a pergola and spaces to add things in at a later stage. For example, while the park design does not incorporate a café kiosk, the terrace is designed to accommodate one in the future. The design of the wooden pergola in the center of the park is a nod to the Tenter’s Field which was located nearby. The Tenter’s Field was an area where the local textile makers brought their cloth to be stretched and dried. It is a timber structure, which will have a roof and no walls and will be used for activities such as chess and table tennis. The playground unit will incorporate mock building facades onto Chamber Street to resemble the Dutch Billy gable fronted houses that once lined the street. The play equipment is designed to make reference to the historical heritage of the area as being central to Dublin’s cloth working and leather tanning industry. This provides the opportunity to communicate this aspect of the local heritage to the children using the play area. The enclosed play area will incorporate a range of play equipment suitable for children up to 10 years old, including children with disabilities. It will have a series of levels with raised platforms accessible by ropes and steps, as well as a lower level accessible to children with physical disabilities. The terrace will provide the ‘hang-out space’ for teenagers and skateboarders to display their skills. The center of the park is divided between a large lawn for games and a smaller raised lawn for sitting and reclining. It is these green areas that are all being interspersed with the polished concrete pathways. 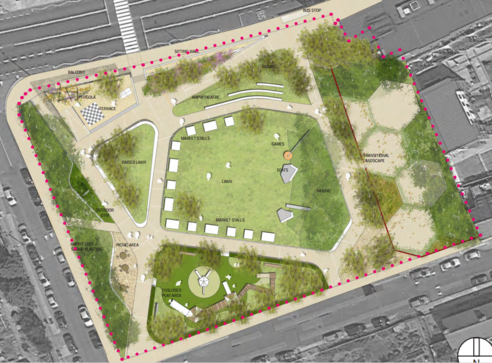 The park is part of Dublin City Council’s long-term plan for The Liberties. Over the next few years, the aim is to achieve social and economic regeneration of The Liberties area, Dublin’s most historic neighbourhood. The plan seeks to develop key sites and explore opportunities to improve the community’s infrastructure and public spaces. The infrastructure improvements will ensure the benefits for both public and residential areas of The Liberties. In a statement to TheJournal.ie, Dublin City Council said that the new park is, “a step forward in addressing the deficit of quality green space and outdoor recreation opportunities in this part of the city.” P Mac is proud to collaborate and to be a partner to Dublin City Council in this initiative. 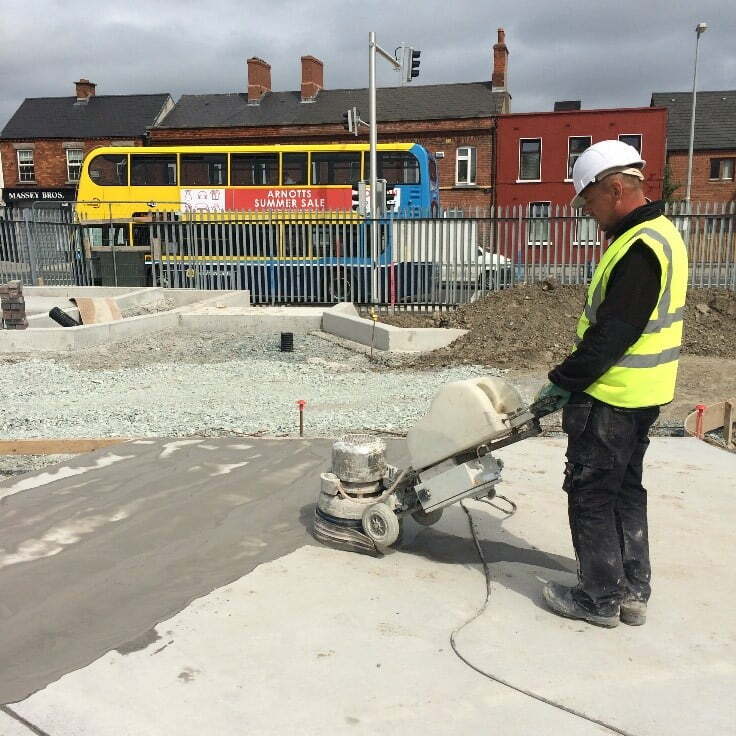 We are also delighted to have been part of the many other projects in the area, such as the restoration of the Whiskey Sills at NCAD, concrete polishing works at the Digital Hub, restoration of St Catherine’s Church on Thomas Street and partnering with Dublin City Council on cleaning the public realm in the area on a ongoing basis. The whole team is looking forward to seeing the finished park open its gates in the very near future! We may even try our hand at a few skateboarding moves! 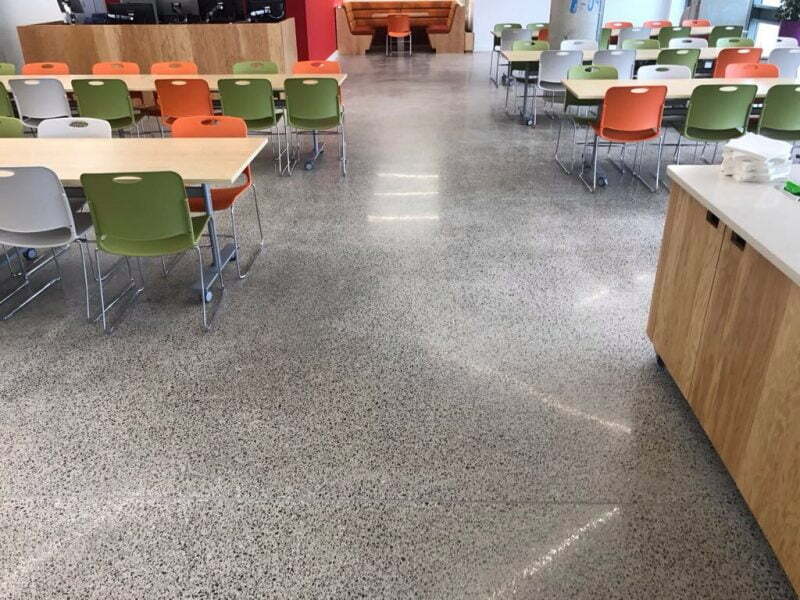 Hotel opts for a slip resistant coating on its floors Maintaining marble, without losing your marbles!